Olympic Green Epoxy coated shelves and posts carry a 7 year limited warranty against rust and corrosion, making them ideal for use in humid environments. Tapered openings in the shelf corners slide over the tapered split sleeves providing a positive lock. Shelving units may be assembled in minutes without the use of any special tools. 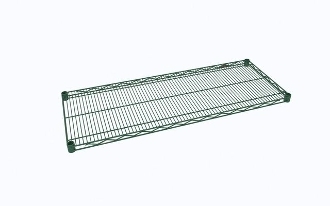 These green epoxy finish shelves are available in a wide variety of sizes. One order equals (1) shelf. NSF LISTED. For product specification sheet OLY-001E.